No rules just lots of creative fun and sharing. Please add me as a challenge participant. I'm not sure if I can make one a month but will try to make a few during the year as my scraps are out of control. Your string quilts are beautiful! 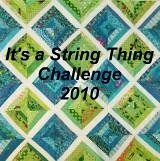 I would love to join your string quilt challenge! What more should I do to get started with all of your girls? Hi Rana, I'd love to have you join us. Your blog is terrific. I Love that yummy looking dessert. Just send me an email with your email address and I will send you an invitation. I LOVE your scrap pile! !